GREENVILLE COUNTY, S.C. – There’s a man-made trail winding through the woods near the Fleetwood Manor Apartments, leading to an abandoned home on the edge of a pond. Children say clowns live there. A woman told a responding deputy that her son had “seen clowns in the woods whispering and making strange noises” at around 8:30 p.m. that night, according to the report, which was obtained by 48 Hours’ Crimesider. She said the boy led her to where he saw the clowns, and then she also saw them “flashing green laser lights” before they ran away into the woods, according to the report. Around that same time, the woman’s older son reported hearing ”chains and banging on the front door” of their residence. The deputy investigating the case said another woman at the same apartment complex said she saw a clown outside around 2:30 a.m. that morning. Several children in the area told police clowns had displayed “large amounts of money” in an attempt to lure them into the woods. The children said they believed the clowns lived in “a house located near a pond at the end of a man-made trail in the woods,” according to the police report. Greenville County Sheriff’s Office Master Deputy Ryan Flood told Crimesider deputies investigated the house but found no clues. Flood said witnesses have declined to give police their names. Eight days after the initial sightings, police began receiving new reports. In one of two sightings reported on Monday night, a teenage girl told sheriff’s deputies she saw a man taking pictures of kids, and shortly after, saw a man wearing a black jacket and a clown mask coming out of the woods. In the most recent incident, on Tuesday night, Greenville city police responded to a clown sighting near an apartment complex, where a witness said the clown left in a car, before police arrived, reports CBS affiliate WSPA. 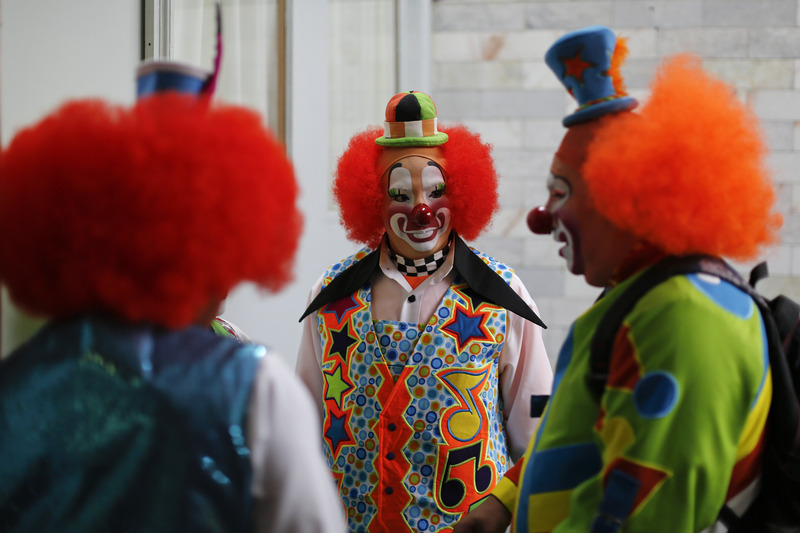 In another incident that was not reported to police, residents told WSPA that they chased clowns after kids told them the clowns were by the playground. They told the station they saw the clowns drive away in a dark-colored car. It is not clear how many clowns were inside the vehicle. Investigators in Greenville County, where Flood said there is no history he can recall of unusual clown sightings, are so far stumped. In all the reported cases, deputies and officers were unable to recover evidence that could substantiate the reports. Flood said there were no surveillance cameras monitoring the areas where the clowns were allegedly spotted. Flood said police have increased patrols in the areas where clowns were sighted.